If you own oil and gas rights in the Marcellus or Utica Shale regions of Pennsylvania you have received countless letters, flyers or other solicitations from third parties seeking to “buy” your oil and gas rights. If you are considering permanently selling your oil and gas rights, BE CAREFUL! The decision to permanently sell your oil and gas rights may seem attractive as the company seeking to “buy” your rights promises you thousands of dollars per acre, but there are many very serious issues landowners need to fully consider when permanently selling their rights. 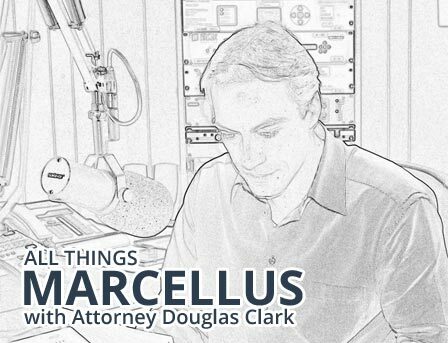 Attorney Doug Clark believes that permanently selling oil and gas rights should only be seriously considered in very limited cases. Out of state Gas rights “Buyers” and their Brokers know many powerful tricks of the trade and operate aggressively to the Seller’s detriment if you are not informed and protected. Third party solicitations and offers to “buy” oil and gas rights are generally loaded with powerful loopholes favoring the “Buyer” and offer little to no protection for the landowner “Seller”. This is absolutely not an area that any landowner should venture into without immediately speaking with an attorney very experienced in these complicated transactions. Far too many Pennsylvania landowners believe selling their gas rights is a simple transactions with guaranteed large sums of money, but in fact they are being taken advantage of by unscrupulous out of state “Buyers”. Remember, the decision to sell your oil and gas rights is permanent and these Buyers are not your friends. To the contrary, gas rights Buyers are typically very sharp and experienced business people looking to take advantage of uninformed landowners in need of short term money and capital. Also, keep in mind that that selling your gas rights typically violates the terms of any existing mortgage on your property which can result in accelerating your entire mortgage to become due immediately. If your are considering making the permanent decision to sell your oil and gas rights to a third party, contact The Clark Law Firm, PC today to receive an honest straightforward consultation regarding the pros and cons of permanently selling your oil and gas rights. If you decide to move forward to sell your oil and gas rights Doug Clark will represent you to make sure you are protected through all aspects of the sale and beyond. Do not go through this process alone, and do not sign any document until you contact our office. Attorney Doug Clark is Pennsylvania’s Landowner Lawyer and he is here to protect you. Contact us today!